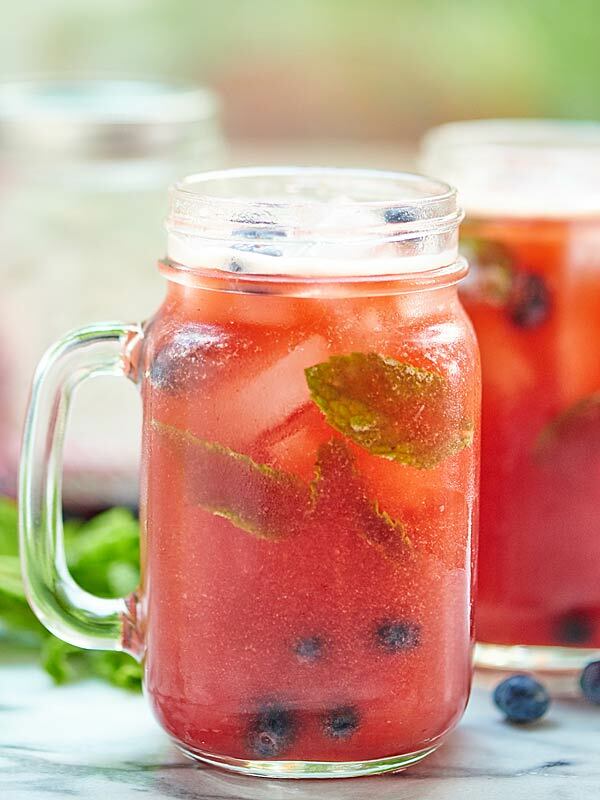 This Blueberry Peach Mojito is the cocktail of all summer cocktails! Peach puree, a homemade blueberry simple syrup, fresh mint, and rum. It’s cocktail time! 1. Strawberry Basil Gin Cocktails: If you haven’t tried basil in a cocktail. Do it. 2. Mango Habanero Margaritas: Spicy, fruity perfection. 4. The BEST Blueberry Peach Mojito: It’s smooth, it’s light, and it’ll be gone before you know it. 😉 This…this, my friends, is the cocktail of all summer cocktails. 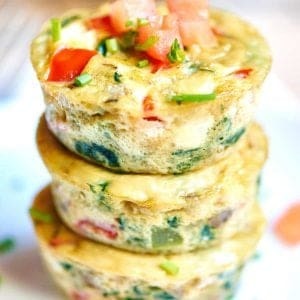 But lets be honest, all these summer cocktails are so darn delicious that I’m not going to pretend that I have a favorite. They’re all my favorites. ♡ h-o-w-e-v-e-r, my latest obsession? Definitely this blueberry peach mojito. Peach puree + blueberry simple syrup + fresh mint + rum = yum. There’s just nothing better to me than enjoying a really tasty cocktail outside and hanging with your significant other and your furry friend. Trevor and I have been having a hard time s-l-o-w-i-n-g down lately and this blueberry peach mojito is just what we’ve been needing. 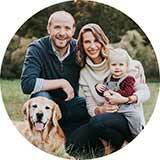 With so much going on: regular blog work, adding videos to all our new recipes, and overall daily life: like making sure Teddy is getting enough exercise, making an effort to see our friends and chat with our family, life can seem overly busy and hectic sometimes. 1. A walk with Teddy. Check! 2. Sitting outside in the sun. Check! 3. Chips and salsa. Check! 4. A fresh mojito. Give me a few minutes…aaaand check! My love for a really good mojito runs deep. My love for them started last summer before we went to Puerto Rico to get married! It only seemed appropriate, that before we went to Puerto Rico, we prepare by drinking mojitos on the weekend. Sometimes you gotta do, what ya gotta do. Lately, with our 1 year anniversary coming up – I can’t believe it!!! – I’ve been missing my mojitos. 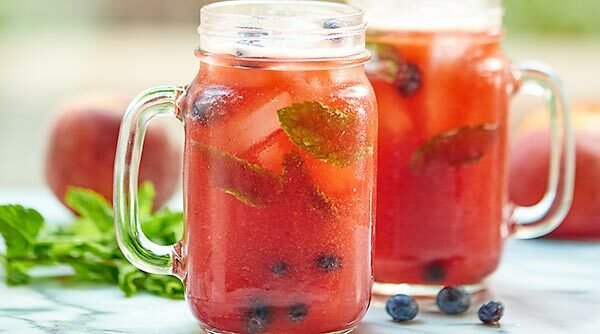 With blueberries and peaches in season, and, um, TOTALLY on sale at the grocery store, I knew I needed to do a little twist on the classic mojito recipe. And that is where the blueberry peach mojito idea was born. 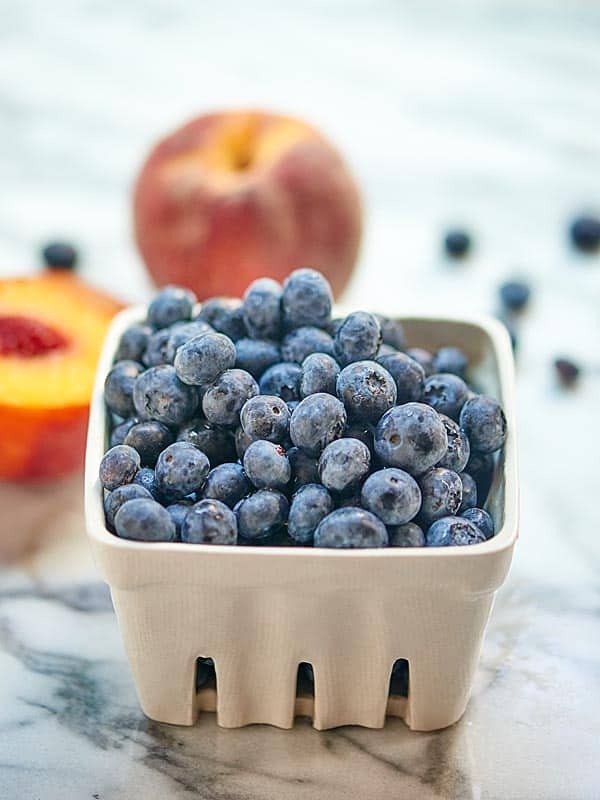 Now, I didn’t just want to muddle the blueberries and peaches with the mint… I wanted something more fun and I wanted to make sure the peach and blueberry flavor really packed a punch! So I decided to infuse my blueberries into a simple syrup. The result? 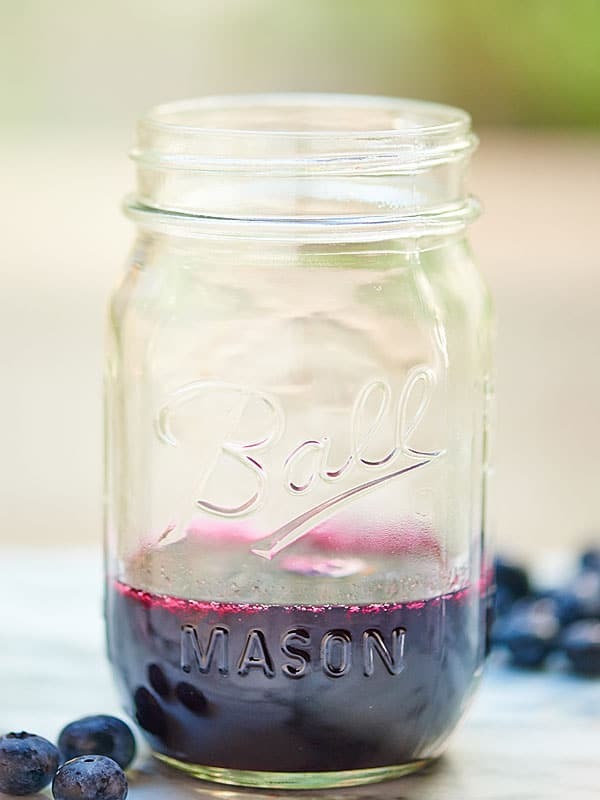 A gorgeous deep purple colored simple syrup that tastes ah-mazing. And with the fresh peaches? I ♡ fruit puree in my cocktails, so I knew I wanted to puree the fresh peaches. 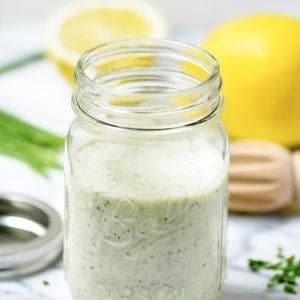 The puree gives the cocktail such a great consistency, too. The nice thing about the blueberry simple syrup and the peach puree is that you can make both of those components ahead of time! Then you can easily make a Blueberry Peach Mojito to order. Here’s what you need to do: muddle fresh mint with freshly squeezed lime juice. Stir in the simple syrup and peach puree. 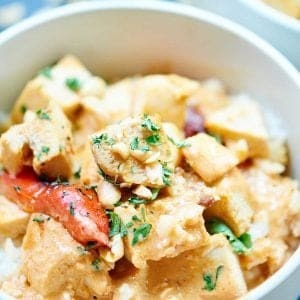 Top this with ice, pour in your white rum (♡ ♡ ♡), and top with club soda! Give it another stir, gawk at how pretty this blueberry peach mojito cocktail is, and love your life. What’s your favorite summer cocktail? Show me the yummy! PS – I used this muddler and this jigger . I ♡ them. 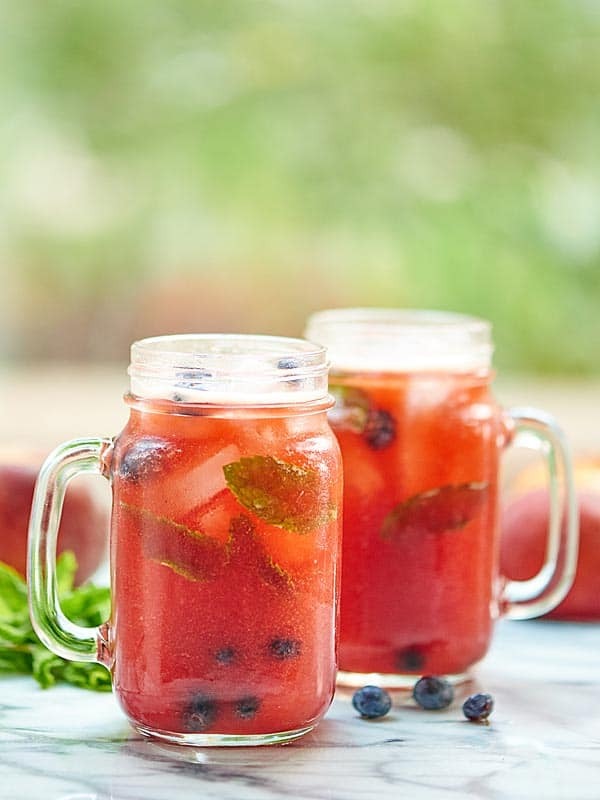 This Blueberry Peach Mojito is the cocktail of all summer cocktails! Peach puree, a homemade blueberry simple syrup, fresh mint, and rum. It's cocktail time! Blueberry Simple Syrup This makes enough for 4 cocktails. In a medium sized sauce pan, combine sugar and water. Place over medium heat and stir until the sugar has dissolved. Keep the heat at medium, stir in blueberries and bring to a simmer. This might take a few minutes. Once it starts simmering, keep it at a simmer for 3-4 minutes or until the blueberries have started to break down. You may need to adjust your heat up/down to maintain a simmer. Carefully strain blueberry mixture through a fine mesh strainer and let cool to room temperature. 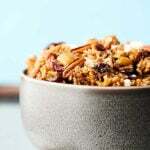 Use immediately or store in the fridge for up to a week in a closed container. 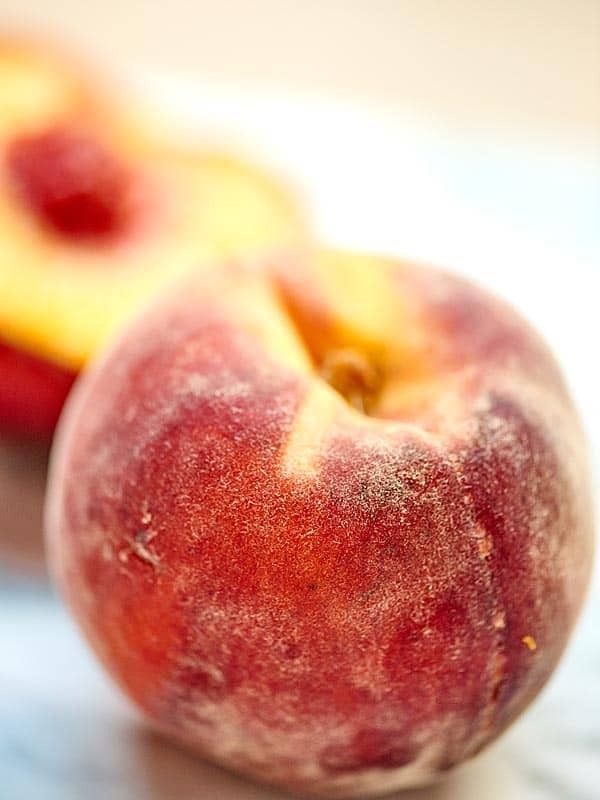 Place washed peach(es) into your high powered blender and blend until smooth. Gently muddle mint leaves with lime juice. Stir in syrup and peach puree. Pour in rum and top with club soda. Stir gently and serve immediately. Garnish with extra mint, blueberries, if desired.